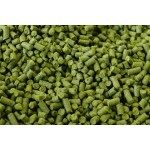 Hop Pellets are whole hops that have been dried, ground and pressed into a mold. Resins seal the outside of hop pellets when they are pressed, leaving the interior fresh. 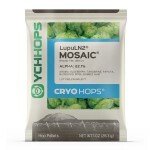 Store hops in your refrigerator or freezer for the longest life. The current crop Alpha Acid % is printed on each package. NOTE: WE ARE TRANSITIONING OUR PELLET HOPS TO FROM 2 OZ BAGS TO 1 OZ BAGS. When purchasing, be sure to take note of what size bag is listed so that you get the quantity you need! Cryo Hops® represent the most innovative hop product technology available. Utilizing industry-le..
Ahtanum is an excellent aroma hop with moderate bittering qualities, very versatile in its uses..
Amarillo hop pellets are bursting with floral, tropical and citrus flavors and aromas. Ideal for bit.. Formerly known as #483 from the American Dwarf Hop Association, this Washington state hop was named ..
Cascade Hops are the classic American Ale hop. This extremely popular hop has distinct grapefr..
More intense citrus flavors and higher acids than Cascade, sometimes called a super Cascade. C..
UK Challenger is a very versatile hop with great hop aromas and higher alpha acids making it su..
Chinook is an old classic that has started to re-gain some popularity among craft brewers. Kno..
One of the most popular new hops for beer making, Citra is known for its intense citrus and tropical.. Cluster is a traditional American bittering hop with strong floral and spicy characteristics. Excell..
Columbus is a high alpha % hop typically used for bittering. But its pungent aromas make it great fo.. Crystal has a mild, spicy floral character making it a great low acid lager hop. Domestic hop,.. Developed by Hop Breeding Company and released in 2014, Ekuanot™ HBC 366 features pronounced aroma c..
A pellet blend comprised of seven "C" hops and additional experimental varieties. Includes Cascade, ..
Fuggles is described as having earthy, woody and mild fruit characteristics. Excellent for English s..
Australian Galaxy is a high-alpha hop. With the high alpha levels, it works well as a bittering..
Next-generation German hops for 21st century craft beer: highly aromatic, tropical, floral, and frui..
1 Ounce Bag Bred by the Hop Research Center of Hülll Germany, this new variety is a daughter..
Mandarina Bavaria displays distinct tangerine and citrus flavors, pleasant pineapple fruitiness and ..
Glacier is an excellent dual purpose variety with balanced bittering properties combined with a..
Hallertau is a classic noble hop variety. Mild and pleasant, yet spicy, with herbal and floral chara..
German Hersbrucker is a delicate aroma hop used mainly in lager type beers. Mild, herbal and f..
UK East Kent Goldings. Great ale hop with a smooth, delicate floral aroma. Great dual purpose ..
Aroma-type hop, originated from a cross between Cascade and USDA #19058 male. Features aromas of Lem.. Developed by Hop Breeding Company and released in 2016, Loral® Brand HBC 291 has a noble heritage th..
German Magnum is an aggressive super-alpha bittering hop (Use caution and weigh carefully!) &nb.. Released in 2012, Mosaic is a daughter of Simcoe. Features relatively high Alpha acids and low ..
Mt. Hood is a great American aroma hop with similarities to the German Hallertau and Hersbrucke..
New Zealand Nelson Sauvin hops, named for its similarity in flavor to Sauvignon Blanc wine gra..
Northern Brewer is a true dual purpose hop. Smooth bittering hop despite higher acid with medi..
Nugget is a high alpha acid hop great for bittering ales, stouts and barley wines. Also has a g..
​Palisade is an aroma type cultivar typically used for its aromatic properties and moderate bitterin..
Perle (US). Slightly spicy hop with fresh hop flavor. Dual purpose hop can be used in a variet..
Czech Saaz - The classic "noble" aroma hop with long and strong traditions, associated with the..
Simcoe is commonly known as a bittering hop with good aroma characteristics. Very unique, pine-like ..
Sorachi Ace has a very intense citrusy aroma, more lemony than grapefruit or tangerine. Packed with ..